In 2015 Art Taichung, the LIPEN Art Galerie is planning to show its management philosophy, diverse collections of artwork, and international perspective by relying mainly on Taiwanese young artists supplemented by the works of old masters' art pieces from Taiwan. The artists the LIPEN is finalizing to present in this joint exhibition this year are Chin CHANG, Weihao KUO, Yihong JIAN, Linglin CHIU, Shihhan TSENG, Lizhen LINZAI, five young contemporary artists. As a contemporary multidisciplinary artist, Chin Chang has devoted herself full-time to create art since 1997. Her work represents female images in a strong visual style, combined with fashion and oriental elements. She manipulates mix media, various techniques, and complicated process, to accomplish realizing the dual core of her creation, "return" and "play." Chang has been invited for cooperation with numerous international brands, including CHANEL, NOKIA, and SHISEIDO. She is the author of the poetry picture books, "Chance Meeting", "No.2, Lady Lane", "Love, Solo", etc. Chang has shown internationally in solo exhibitions and group exhibitions in Taiwan, London, Beijing, and Shanghai. KUO Wei-Hao graduated from the Department of Fine Arts, National Kaohsiung Normal University. His works, through the description of Hualien's natural scenery and natural disaster, express the feelings in his real life. He is also exploring the possibility of some unexpected among the vast sea. Moreover, four young ink color artists create thinking of contemporary ink color world. Also, LIPEN will present the works of Shihchiao LI , Ruilin HONG , and Dejinn SHIY, three representative masters of Taiwan. 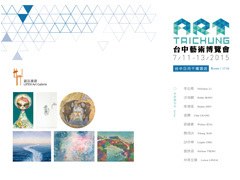 Taichung is one of the centers of culture and art, Taiwanese young artists'art pieces can be constituted the main show. LIPEN foresees more weight of these artists in the field of arts and the international art markets by means of this Art Taichung 2015 and further hopes to spark people's imaginations about art. 1F, No.12 Lane 329 Sec1, Dun-Hwa South Rd.TPE © 2013 LIPEN Art Galerie. All rights reserved.